That’s right folks, I’ve been dragged kicking and screaming into the 21st Century, finally relenting and giving YouTube a go. One may ask what too me so long and I guess the answer is simple: YouTube terrifies me. I am very comfortable at a keyboard, hiding behind words and photographs, but stick me in front of a camera and the fear sets in! Eek! Anyway, YouTube is a very popular medium and it’s hopefully a way to expand The Candy Perfume Boy’s audience. So for that reason I will be bringing you a weekly video for you to hopefully enjoy. Some of the videos will be reviews of things I’ve written about already, whilst others may be things that haven’t quite made it to the blog yet. I’m sure I’ll also get some lists up in the future too! Do let me know what videos you would like to see going forward. We recently recorded an upcoming battle episode of Fume Chat at Perfume Lovers London and one of the subjects that came up was MUGLER. No surprises there, of course, everywhere I go MUGLER must be mentioned, but what was interesting was the fact that everyone seemed to agree that, when it comes to flankers, nobody does it better than good old Thierry M. I’m on board with this too and whether MUGLER are creating candy floss versions of Angel or spiced-up versions of A*Men, they’re always making some fascinting, and beautifully smelling things. One of MUGLER’s fragrances that always lends itself well to flankerisation is Alien, the brand’s supreme being. Alien has been treated to many injections of flavour scent and texture, and following their launch of Alien Oud Majesteux last year, MUGLER have added Musc Mystérieux, another instalment to what they’re calling the Oriental Collection. Created by Perfumer Dominique Ropion, this version of Alien plays homage to the ancient ingredient of musk, presenting a smoother and more transparent take on tonkin musk – a solar musk. Please forgive my excitement, fellow perfume nerds, but it simply cannot be contained today, for there are now Angel chocolates on the market. Now, if you know me, you know that there are three things I hold dear to my heart in this world; 1) my family (including my cats) and friends; and 2) food; and 3) MUGLER. So it stands to reason then, that the idea of MUGLER themed chocolates, nay ANGEL themed chocolates would get me just a tad excited. Well that’s exactly what’s got me going today and hopefully they will do the same to you! 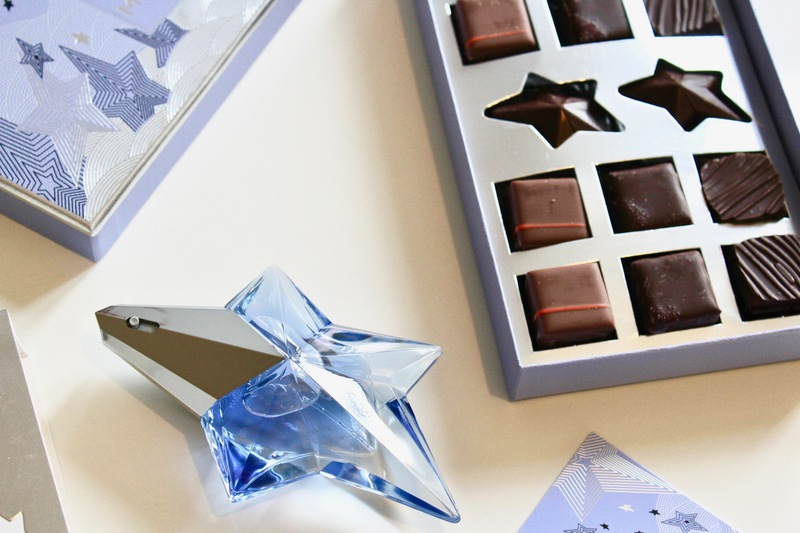 So, MUGLER have teamed up with another legendary French house, the chocolatey heaven of La Maison du Chocolat to translate their most iconic fragrance into a gustatory delight. The result is a box of beautiful chocolates that break down the three key accords of Angel into edible delights that are as indulgent as the scent itself. If, like me, you were trying to diet then I’m sorry, Angel has other plans for you and as we all know, she does not take no for answer.